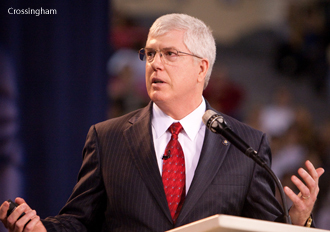 Mat Staver, dean of Liberty University School of Law, speaks at Liberty University convocation Nov. 11. Mat Staver, dean of Liberty University School of Law and founder of Liberty Counsel, appeared on CBS’ “The Early Show” Wednesday morning regarding a complaint Liberty Counsel filed with the FCC against ABC for airing the controversial performance by Adam Lambert during the 2009 American Music Awards. Dean Staver said on the national television program that Lambert’s performance was shocking and patently offensive. He said Lambert’s performance came without warning and that ABC should be fined for airing the segment. In the complaint, the performance was called “obscene” and “indecent.” Under the laws regulating televised broadcasts, particularly between the family viewing hours of 6 to 10 p.m., the Federal Communications Commission prohibits obscene or indecent performances. “Liberty Counsel urges the Commission to take action against ABC, Inc., for airing such an outrageously lewd and filthy performance during a show and time period that is targeted for family audiences,” the complaint reads. Staver is considered one of the premier constitutional litigators in the country and conducts hundreds of media interviews each year. 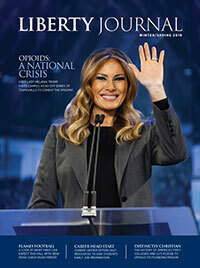 Liberty Counsel is a nonprofit litigation, education and policy organization dedicated to advancing religious freedom, the sanctity of human life and the traditional family. Established in 1989, Liberty Counsel is a nationwide organization with offices in Florida, Virginia and Washington, D.C., and hundreds of affiliate attorneys across the nation.